Home > News > Do you recognize these burglary suspects? Do you recognize these burglary suspects? Ada County Sheriff’s Office detectives would like to know if anyone recognizes the men involved in two separate but similar burglary cases from last month. The first one occurred Jan. 15 inside the Stage Stop at 23801 S. Orchard Access Road. 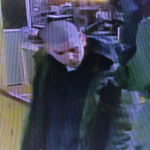 Surveillance video shows two men — one with a hood covering his head and the other with a shaved head — walking into a custom knife and leather shop inside the Stage Stop just after 5 p.m. that day breaking into a locked case and stealing five knives. The two men were seen getting out of a large white passenger van before the theft occurred. 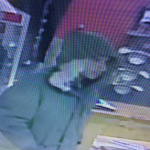 The second burglary occurred just before 2 a.m. Jan. 29 when two men walked into the Maverik store at 6168 S. Cloverdale Road. One man asked the clerk to make some fresh coffee. When the clerk walked over to make the coffee the other man reached behind the counter and stole several scratch-off lottery tickets. 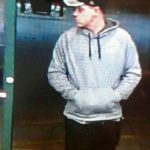 The two men then used cash to buy a few items, left the store, and drove away in a black BMW sedan. 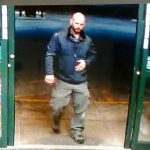 The man who took the tickets was bald and wearing green pants and a dark jacket. The man who asked the clerk to make coffee was wearing a grey sweatshirt and a Pittsburgh Steelers hat. Anyone with information on either burglary should send an email to cau@adaweb.net or call Ada County non-emergency dispatch at 377-6790.